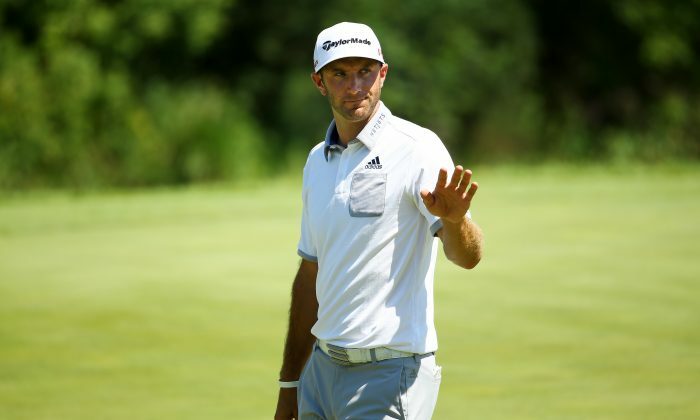 2015 PGA Championship: Can “DJ” Play the Right Song? Sheboygan, WI—In what is becoming a standard song for Dustin Johnson—also know as “DJ”—he has once again inserted himself as a major presence at a major event—the 97th PGA Championship. The issue is not hearing DJ’s song at the beginning of a key event but wondering if he can play the right song all the way through and finally earn his first major triumph. DJ’s play during the first round at The Straits Course was vintage stuff. When Johnson is driving the ball both long and straight and his putter is cooperating, he makes golf look like a very simple game. Conditions in the morning tee time wave were mild given how winds escalated for players in the afternoon draw. Johnson did what he has done at both the U.S. and British Opens this year—take command of the top spot this time with a six-under-par 66 and a one shot lead. To DJ’s credit he just keeps on placing himself in the mix. Other players might have faded from view after doing what he did at this year’s U.S. Open when he three-putted the 72nd hole and fumbled away at minimum a playoff against eventual winner Jordan Spieth. Or, the very next month, when DJ held the halfway lead at The Old Course at St. Andrews in The Open. Inexplicably, Johnson shot consecutive rounds of 75 on the weekend and literally his song stopped playing. It was in 2010—the last time the PGA Championship came to this remote spot in Wisconsin set alongside Lake Michigan—that Johnson had the lead going to the final hole when he inadvertently failed to realize his tee shot landed in a bunker and he could not ground his club in playing the shot. Johnson was penalized for his mental error and what could have been a winning moment with him hoisting the Wannamaker Trophy only continued a trend in which Johnson figured out a way to permit other players to take the glory with major wins. Give DJ considerable credit because he views the past in a healthy way—it’s finished. The issue is whether this supremely talented player can finally do what so many others believe he is fully capable in doing—winning big time golf events. The Straits Course is a quality venue that works well for Johnson. The layout rewards power when matched with good accuracy. The windy conditions force players to excel in getting from tee-to-green with solid shots and DJ is more than capable in doing just that. The putting surfaces on The Straits Course are also not especially devilish where putting—a weak suit for him most times—should not be an overriding concern. Nonetheless, one can only wonder if this freakishly gifted player can finally push open the door to greatness that has been to this point an insurmountable one. It’s been said by a few golf commentators—quite correctly I might add—that should Johnson win his first major this week he is fully capable in winning several others as well. But you don’t win two majors until you claim the first one. Phil Mickelson went through a similar situation until winning the ’04 Masters. DJ has been able to show he can start the song in the right manner but can he finish the song all the way through? The issue in golf is that often times the margins between players is so slight. DJ has shown an almost nonchalance when he has failed to take his considerable talents all the way through to its rightful conclusion. One can only wonder if any tournament scar tissue has accumulated with each of the train wrecks has caused or if he that rare player with a Teflon skin coating who just doesn’t allow past matters to phase him. The 1st round at this year’s PGA Championship played a familiar song– DJ playing first rate. That song is an old one. Can DJ play the right song through Sunday? That’s a recording he will need to show he’s capable in finally doing.